While there is no news of Instagram for Windows Phone 7*, an independent developer has released an alternative app of sorts called InstaCam. Details after the jump! For the uninitiated, Instagram is a popular photo-editing and sharing service. It lets users take a photograph, apply a filter onto it and then lets them share the edited photograph to popular social networks such as Twitter, Facebook, Foursquare and services like Flickr. As of typing, it only works on iOS devices with an Android version on its way. 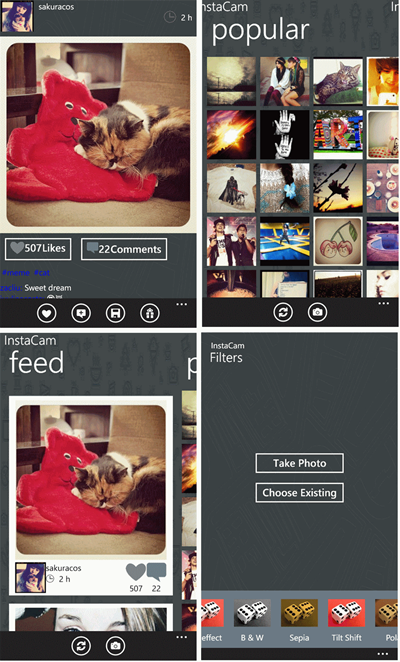 Developed by Life Ideas, InstaCam is, unofficially, Instagram for Windows Phone 7. It lets you do just about everything that you can do with Instagram on iOS: browse photos, comment/like etc. Except it doesn’t do the snapping part, a huge bummer. Try out the InstaCam app! View photos on Instagram, comment, like, enjoy! Make your own photos unique by adding different filters. We tested the app on a Windows Phone device and can confirm that it works as advertised. Its user-interface isn’t as good-looking as Instagram for iOS, but (most of) the basic viewing, commenting and liking functionality is there. While there are apps like Bubblegum that mimic Instagram’s features, InstaCam’s specialty is its integration with Instagram’s service itself. For folks who are anxiously waiting for the official Instagram app for Windows Phone 7, InstaCam should suffice until the real thing comes out. 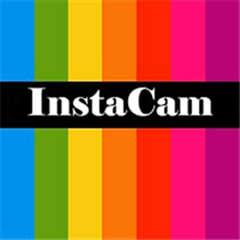 InstaCam is a free app and it can be downloaded from the link embedded below. It only supports devices with Windows Phone 7.5 Mango. Do let us know what you think of InstaCam in the comments section over on our Facebook page. Also, do you think these photo-sharing apps, with all their “hipster filters”, are just a dying trend? I personally believe it is a dying trend since I know plenty of friends who used to use Instagram regularly but have left it altogether now. Windows Phone To Finally Get A Fully-Functional Instagram App? *Windows Phone 7 is stuck pretty badly at the moment. It’s a great smartphone OS, but the software and hardware just doesn’t provide enough incentive for users to jump ship from established platforms like Android/iOS. It needs good, exclusive apps but for that, it needs lots of users. But, again, for there to be lots of users, there needs to be good, exclusive apps.